Commuters have been warned to take care this morning after heavy rain has left roads wet and, in some cases, flooded. MOTORISTS, CYCLISTS AND pedestrians have been warned to take care this morning as Met Eireann issued a yellow alert caution over heavy rain during the night. Between 25 and 35mm of rain is believed to have hit Connacht, Leinster and parts of the midlands overnight, with more rain possible today. AA Roadwatch has warned that some roads are floooded and has urged drivers to use dipped headlights to improve visibility this morning. Met Eireann has said that the rest of today is going to alternate between periods of dry weather and heavy rain, with a band of showers starting off along the west cost and spreading eastwards across the country during the afternoon. The weather warning will remain in place until 6pm this evening. Get any good pics of the heavy rain or flooding? Send them to us at tips@thejournal.ie or tweet us @thejournal.ie. Email “Watch out: Met Eireann issues yellow alert over heavy rain”. 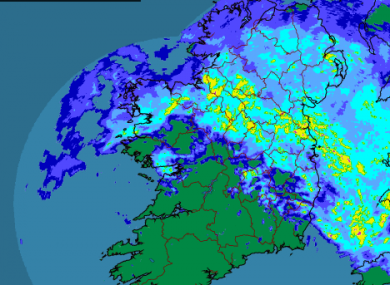 Feedback on “Watch out: Met Eireann issues yellow alert over heavy rain”.